Note that it requires both the librtm library and the rtm dataengine, both of which are also in playground. where CMAKE_INSTALL_PREFIX is the what you specified on the command line (i.e. -DCMAKE_INSTALL_PREFIX=”/local/install”). This defaults to “/usr/local”. After you have authorized the plasmoid and it asks you to close your browser window, click ok to have the applet get its final piece of configuration, the authentication token. This token is stored so you don’t have to re-authenticate all of the time. You should now see your tasks in the applet. By clicking on a tab at the top you can change which list is displayed. 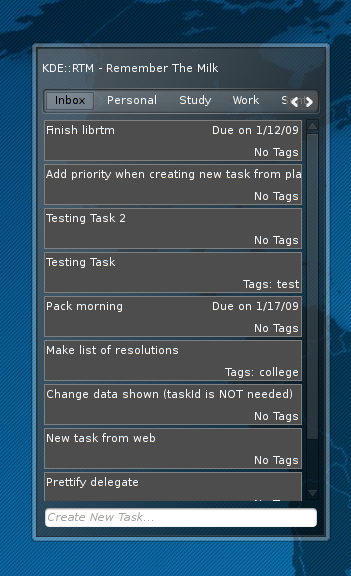 Currently, the highest priority tasks are shown at the top. Sorry, feature freeze for 4.2 was months ago, even before I started work on the plasmoid. Great! I’ve been wanting this for ages, how functional is it? Getting stuff like filtering by tag, and editing the details, into the UI will be really handy. The iPhone app is pretty slick. I’ve never worked with the iPhone app…. I should find someone to show it to me. I’ve only used the web interface. I can’t find those files anywhere. Any suggestions are welcome! Sorry, your message got caught in my spam filters. Firstly: did you specify the same -DCMAKE_INSTALL_PREFIX for both librtm and the dataengine/plasmoid? or find me on irc (I hang out in #plasma and #kde-devel) and I’ll help you get it going. At the moment my only desktop is running KDE 4.2 rc, and therefore I can’t test on 4.1. The KDE 4.2 api documentation doesn’t mention what’s new, but I’m pretty sure that the Plasma::Service architecture has changed (or maybe even come into existence) during the 4.2 cycle. With that said, after some library refactoring last week I’m not really using the Plasma::Service for anything useful and so I might be able to provide a plasmoid for 4.1 users without much trouble. If that becomes a reality I’ll make a post on my blog. Probably if I were you I’d just make libplasma 4.2 a requirement for cmake, and publish it as a requirment here. Most of your potential users will be switching to 4.2 in the coming days, or in the coming months when the distros switch, so maybe your time is better spent on tags, advanced lists, etc. You make a good point, and I definitely don’t want to spend time struggling to support something that nobody will use anyways. I still might take a look at it, as I said, I don’t actually use the features in 4.2 (compared to 4.1) at all more or less. Not very helpful. The authentication works but then nothing happens. the Frob Error String: “Unknown Error” is misleadingly not related to the error for the Frob. “Unknown Error” can be Qt’s way of saying “everything is fine”, or at least that’s what it seems to be in my case, as I get the ‘error’ too. 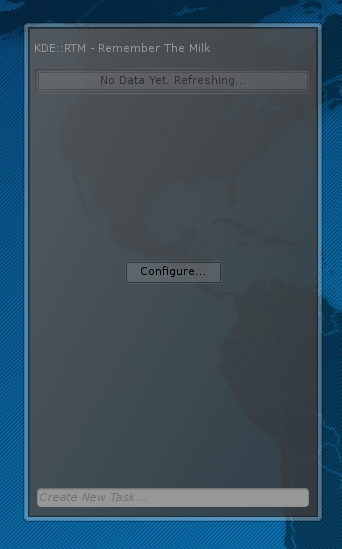 Anyways, when you say “nothing happens” do you mean that the “configure” button is still present? If so, ensure that you authenticate within the rtm website that pops up when you configure, and then AFTER rtm says you can “close your browser window and return to the application” click “ok” on the actual config window. If the config does disappear, and you don’t see your lists in the tab bar at the top then you might be having the same problem as someone else I was helping on email. I’m not sure of the cause yet in that case. but then it opens in regular window, not in docked plasmoid . You should be able to run it as a plasmoid on your desktop if your kdedirs are set up correctly. If you’re having a lot of trouble, try starting plasma from the command line (you would have to shut it down first with kquitapp plasma) with KDEDIRS=/usr/local plasma. On top of priority sorting, could it also sort on due date? What is your desktop background? I find it actually looks better on widescreen monitors because the bars at the bottom and top are cropped. Thanks, but the link seems to be dead. Could you explain to me what exactly should I do to fix this problem? Weird, not sure why websvn would be freaking out. You should be able to just “svn up” for librtm. You can then build and install it as normal. You shouldn’t have to remove your build directory, so it’ll be quick. This is a great little plasmoid. Thanks a lot of creating it. I have specified the same -DCMAKE_INSTALL_PREFIX for both librtm and the dataengine/plasmoid – for shure. His issue ended up being that my blog mangled something relating to -DCMAKE_INSTALL_PREFIX and his files ended up in /include, etc… Assuming your install prefix is /usr/local (which btw is the default, you don’t have to specify it), check that you do have a /usr/local/share/apps/cmake/modules/FindRTM.cmake and that it isn’t empty. I hope this helps. Also note that I made some serious changes to the library, so it might be best to blow away /usr/local/include/rtm and reinstall the library. it would be better (i think) if there wre binaries available or precompiled stuff for less less linux savvy users like myself. I’ve spend 2 hours trying to figure out how to bulid the librtm, and then I couldn’t build rtm-dataengine becaue the error above…biulding the plasmoid failed as well.. This is in KDE’s playground. Playground is an area for software in active development, not for release-quality material. There are not binaries available because the projects in playground change often, sometimes daily or more than daily. At the moment I’m reworking something called the library API, it’s the interface in which the plasmoid talks to the library. I’m not done with this and hence, you will NOT be able to build the plasmoid and probably not even the dataengine at the moment. If you are really looking to get a working build now, you need to use svn revision 954594 or below. Alternatively, there are some people that build and package binaries for experimental software. I know there is at least one on launchpad (Ubuntu/Kubuntu) and one for Arch Linux. Try googling for these. Honestly that’s all I can say for you now, it’s not supposed to be finished, feature complete, or even usable at the moment.